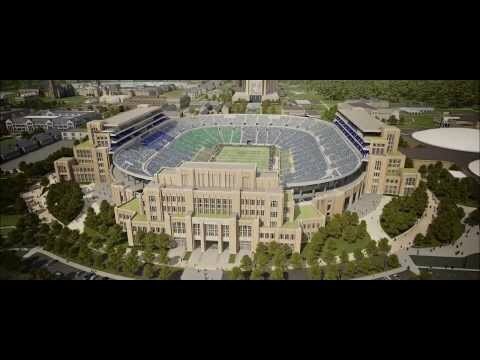 The Campus Crossroads Project will reposition Notre Dame’s legendary football stadium as a year-round hub for academics, athletics and student life. As the largest building initiative in the university’s history, the project includes upgrading the stadium and constructing three new buildings anchored to the west, east and south sides of the iconic structure. The new buildings will add approximately 800,000 square feet of classroom, research, student life, fitness, digital media, performance, meeting, event and hospitality space. The design renews the stadium’s original architectural character and strengthens its connectivity to the surrounding campus. Indoor and outdoor club-level premium seats will be added on three levels within the east and west buildings. Terraces on each building will offer views of the playing field and campus and will be available for campus and community use. Hospitality areas also include loge boxes and new press facilities. HOK is designing these areas to provide an enhanced fan experience for students and alumni while providing flexibility for multipurpose use on non-game days. A new Student Recreation Center in the west building will triple the amount of fitness space available to students. The gymnasium will align with the stadium’s 50-yard line. Other fitness spaces will include an indoor jogging track, boxing areas, a four-story climbing wall and a functional training turf area. HOK is a consultant to architect of record S/L/A/M Collaborative, providing design services for the sports, recreation and hospitality components. 800,000 sq. ft. / 74,320 sq. m.